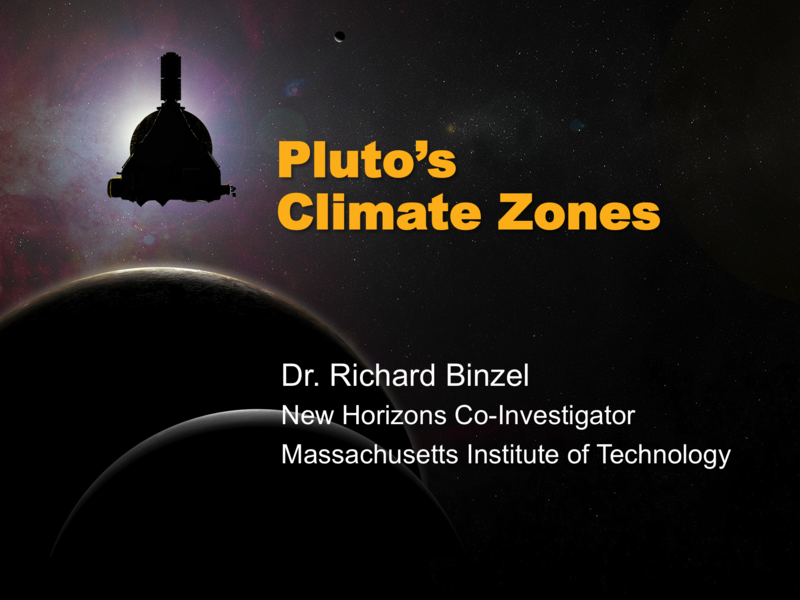 Members of NASA’s New Horizons mission team will present nearly 40 scientific reports on the Pluto system this week during the 47th Lunar and Planetary Science Conference near Houston. The scientists will discuss results included in the March 18 issue of the journal Science, as well as results gathered from analyses of new data since the Science papers were submitted. 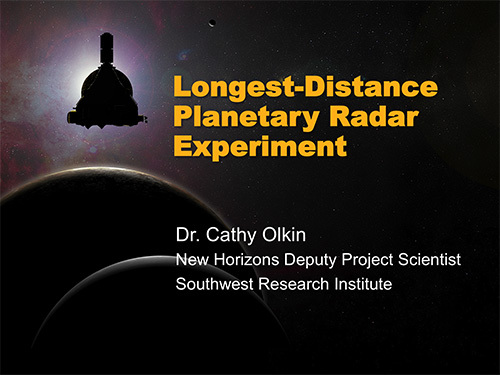 Cathy Olkin, deputy project scientist from Southwest Research Institute, describing how New Horizons measured the radar reflectivity of Pluto and shattered the record for most-distant object ever explored by radar. “It’s a record that should stand for decades or longer – unless, of course, we use that technique again when New Horizons encounters another Kuiper Belt object,” Olkin says. 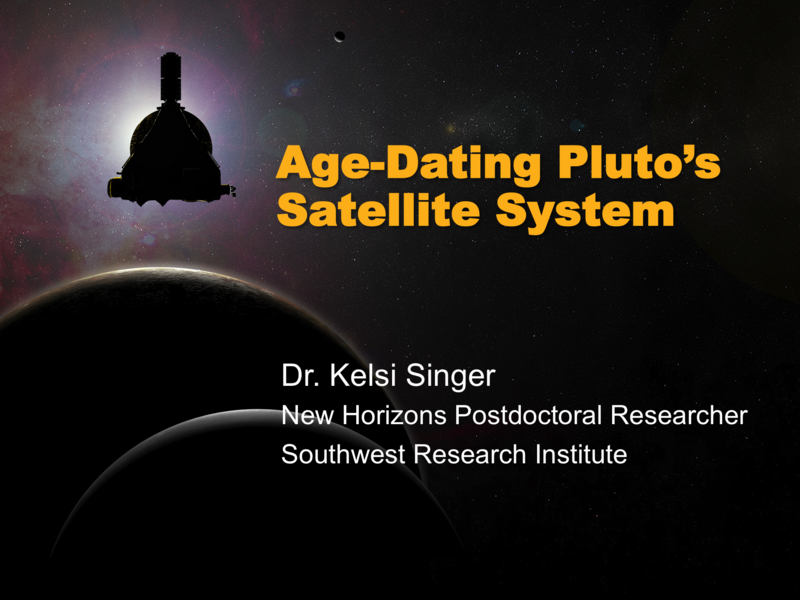 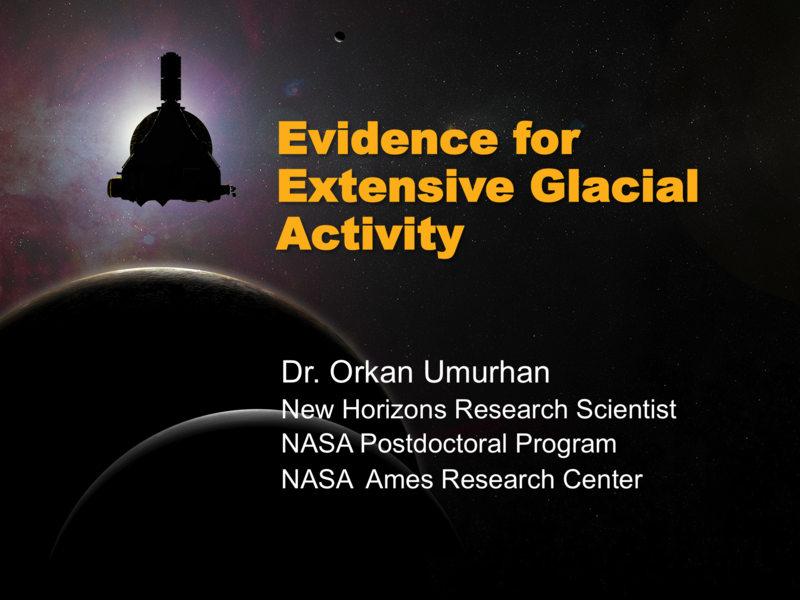 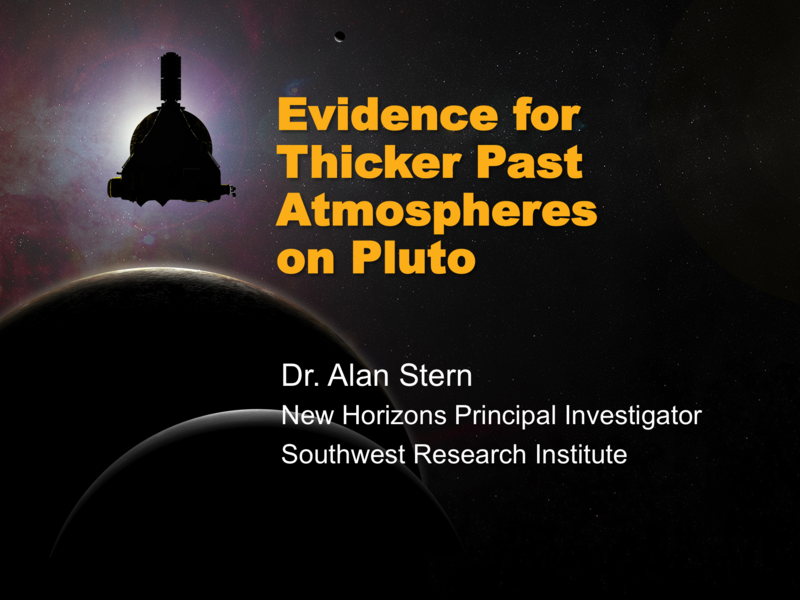 Stern will also deliver a lecture, “The Exploration of Pluto,” on Tuesday, March 22, at 7:30 p.m. CDT. 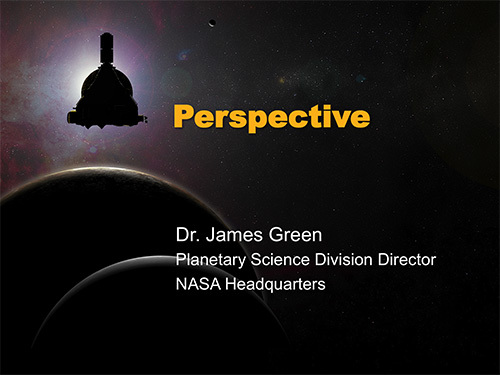 The lecture is free and open to the public, and will be archived online. 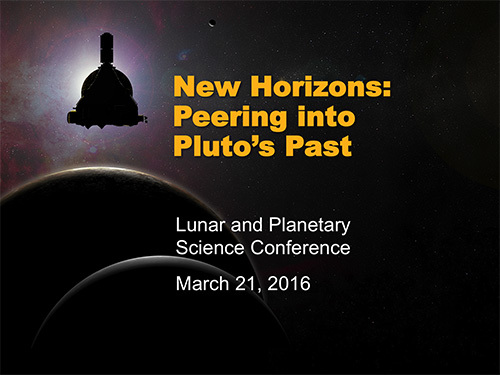 For the full schedule of live and archived Web events, see http://livestream.com/viewnow/LPSC2016. New Horizons team members will be available for interviews at LPSC. Contact Mike Buckley of the Johns Hopkins Applied Physics Laboratory at (443) 567-3145 or michael.buckley@jhuapl.edu to schedule. 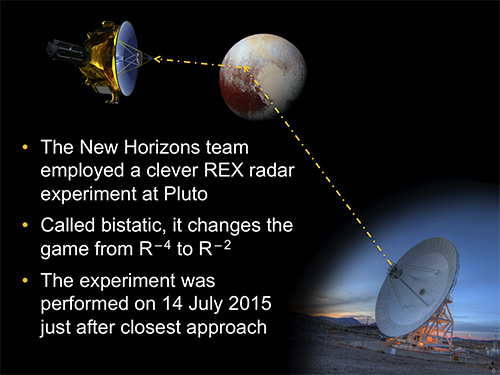 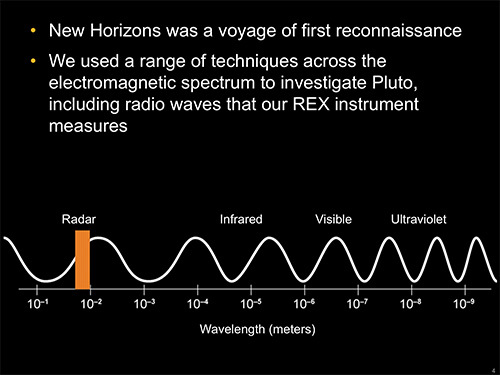 New Horizons used techniques across the electromagnetic spectrum to investigate Pluto, including radio waves that the spacecraft’s radio science experiment (REX) measures. 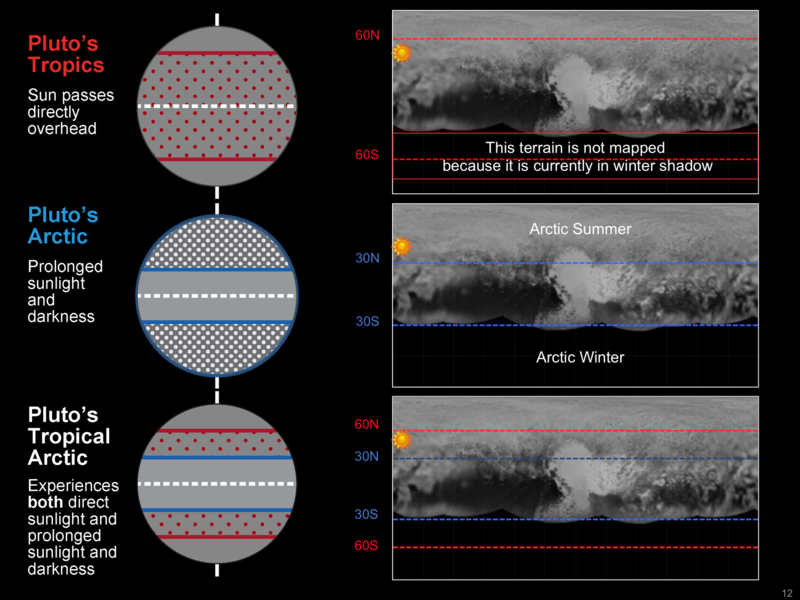 The imaging data is in the visible and near infrared range, but there are many more ways to learn about the Pluto system. 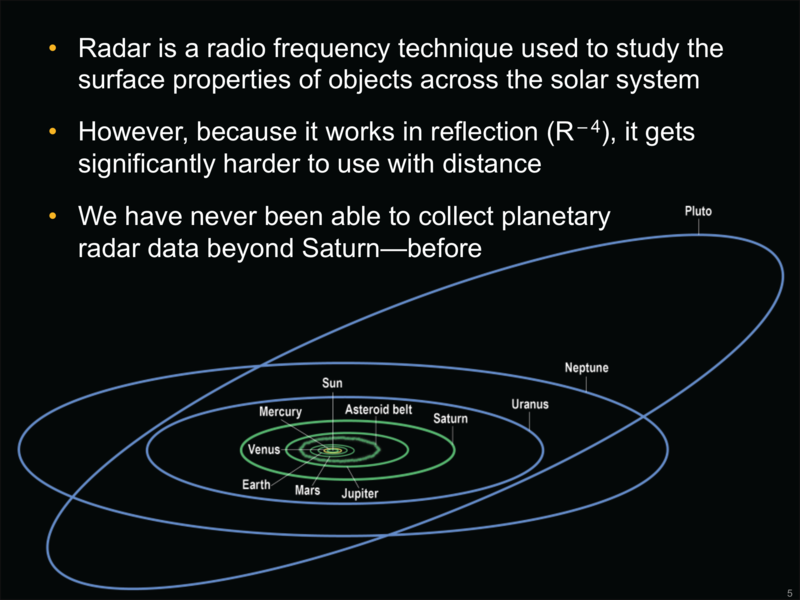 Radar, a radio frequency technique, – has been used to investigate the surface properties of bodies across the solar system, but never beyond Saturn – until the New Horizons mission. 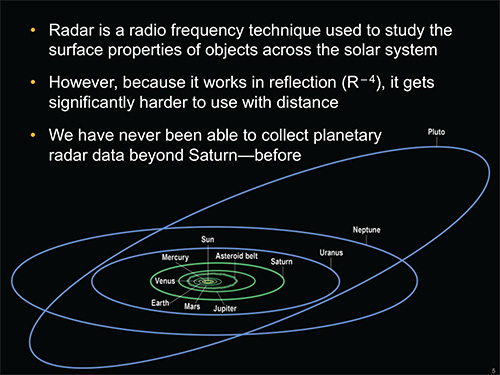 In a bistatic radar experiment, the signal travels from a transmitter in one location, to a receiver in a separate location near the target object. 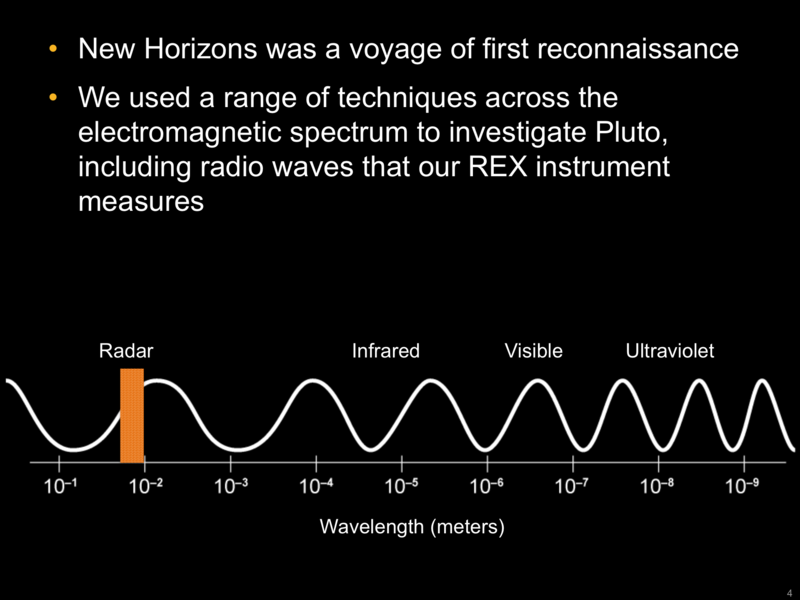 In this case, the transmission came from NASA’s Deep Space Network antenna station, toward Pluto and the radio receiver on the New Horizons spacecraft. 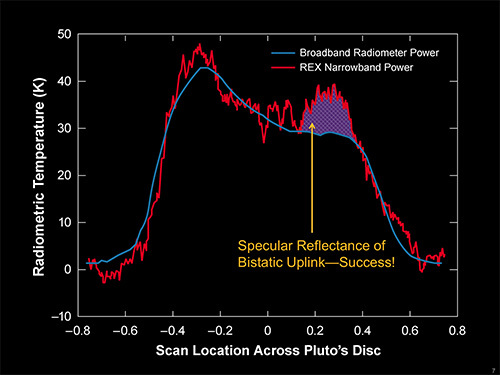 This figure shows the New Horizons radio science data, with the bistatic reflectance indicated. 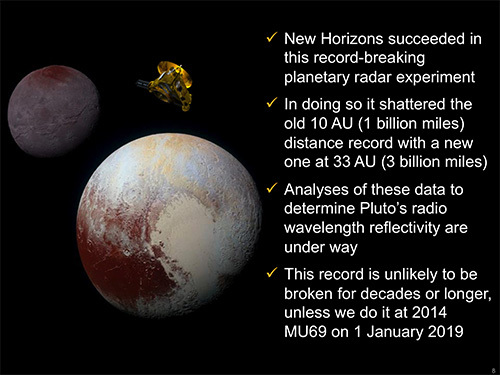 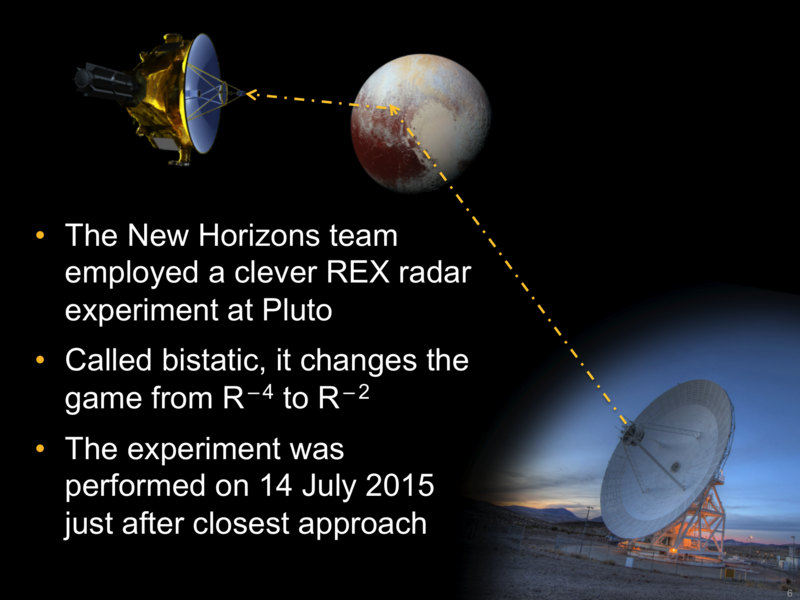 Given the difficulty of radar measurements at such long distances, and that other objects in the Kuiper Belt are smaller than Pluto, the team expects this record to hold for some time – unless New Horizons breaks it at another Kuiper Belt object. Provided NASA approves an extended mission, New Horizons could observe a KBO named MU69 on January 1, 2019. 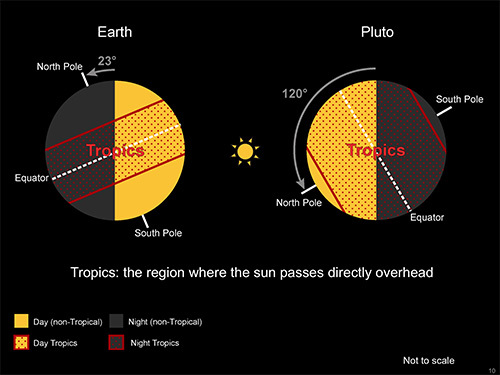 Like Earth, Pluto has tropical zones – they’re not the warmer tropics we’re used to on Earth, but these zones do drive Pluto’s climate. 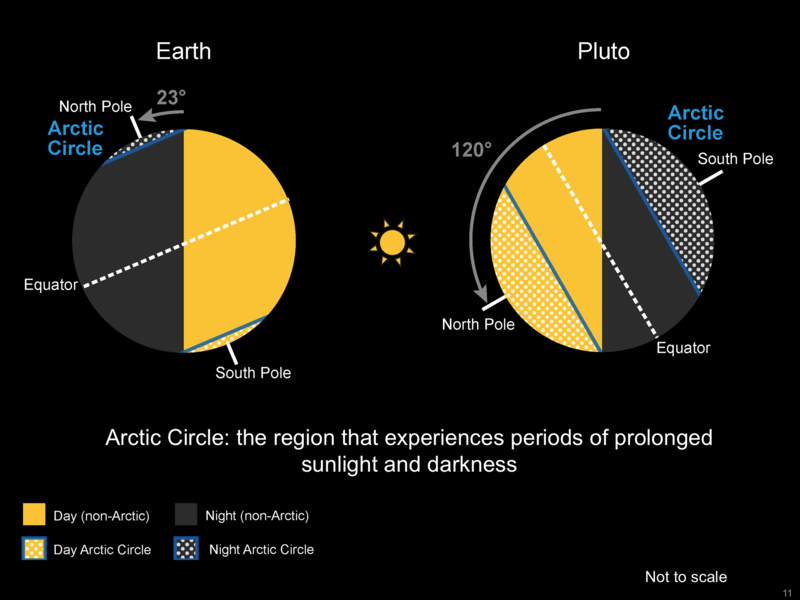 Source: Alissa Earle, MIT. 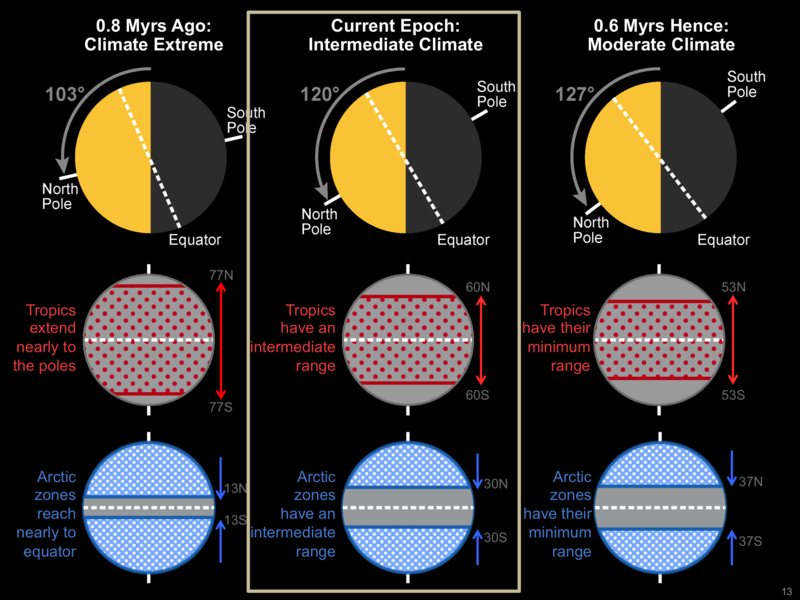 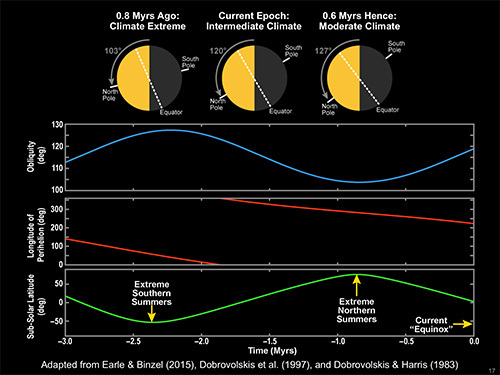 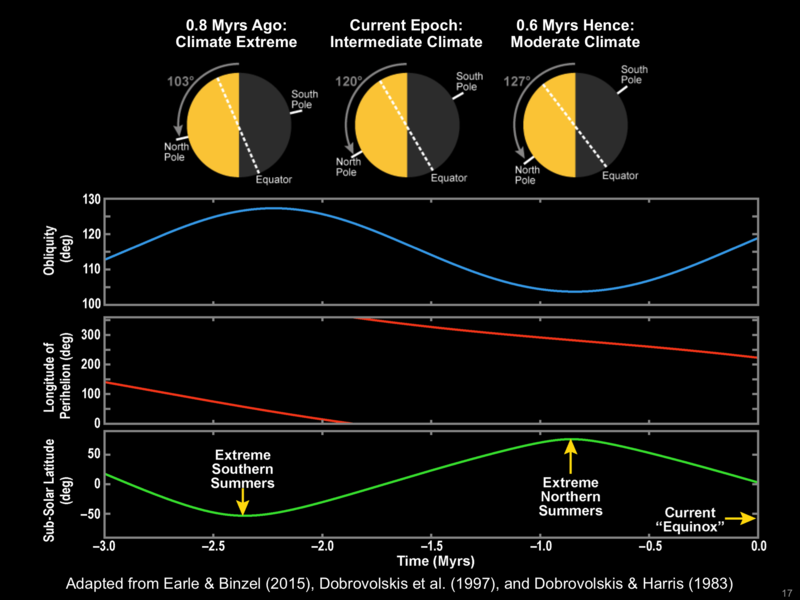 An examination of Pluto’s long-term climate variations includes the finding that Pluto has both tropics and arctic regions. 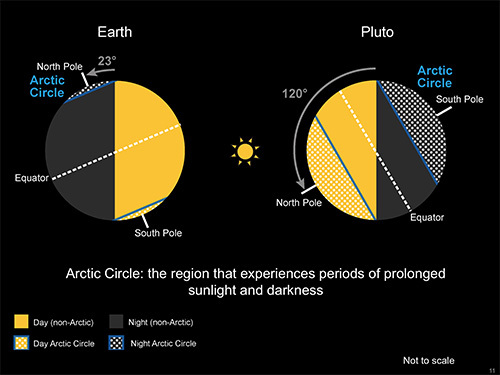 Source: Alissa Earle, MIT. Pluto’s “tropical arctic” experiences both direct sunlight and prolonged periods of sunlight and darkness. 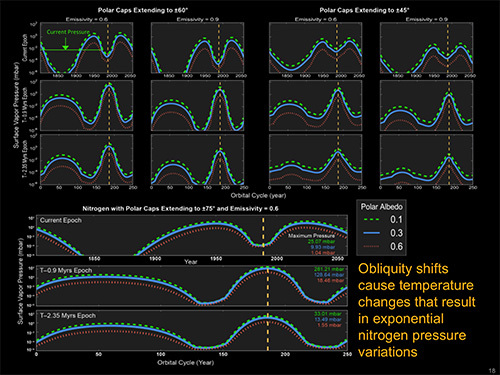 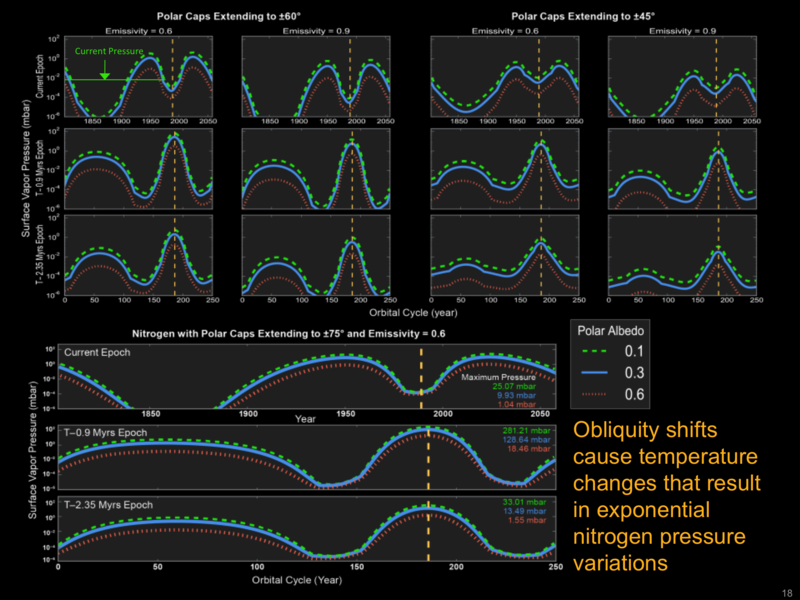 Source: Richard Binzel and Alissa Earle, MIT (adapted from submission to Icarus). Pluto is currently between two extreme climate states. 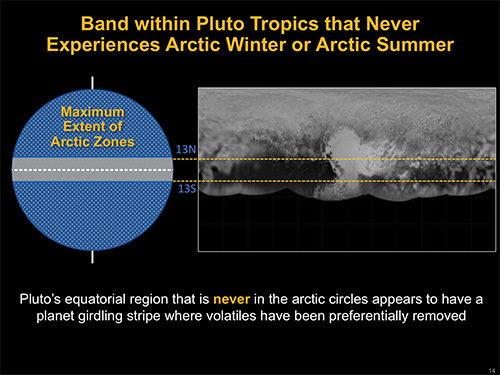 There is a band within Pluto’s tropics that never experiences arctic winter or arctic summer. Source: Richard Binzel and Alissa Earle, MIT (adapted from submission to Icarus). 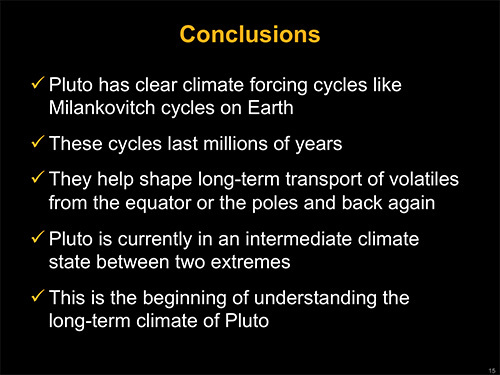 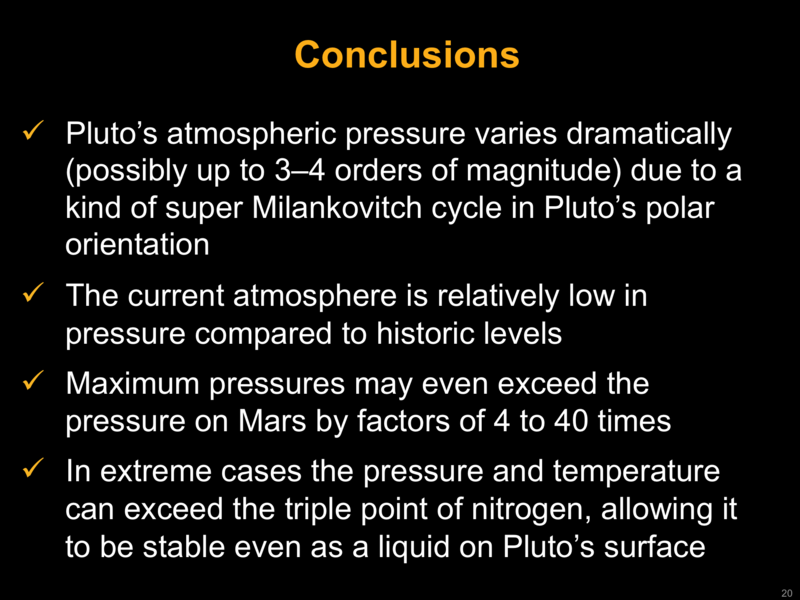 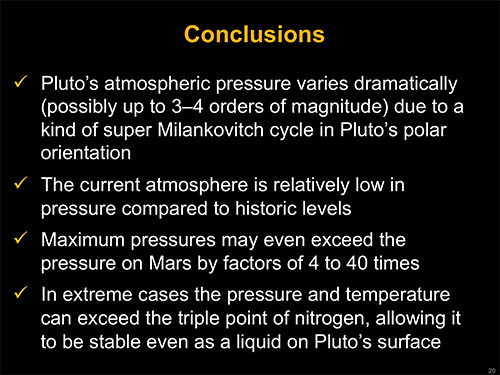 Characteristics of Pluto’s various climate states; the planet is currently between two climatic extremes. 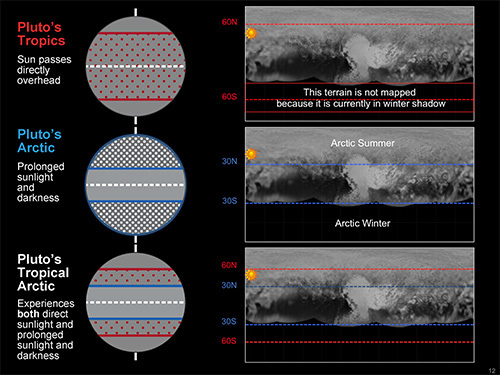 Pluto’s surface vapor pressure, over the course of an orbital year (about 250 Earth years), during different climate epochs. 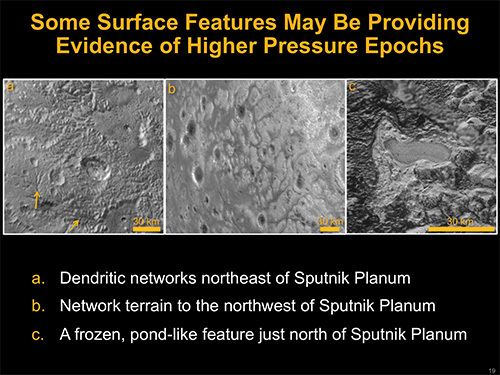 Several surface features on Pluto – viewed in the informally named Sputnik Planum – may provide evidence of higher-pressure epochs. 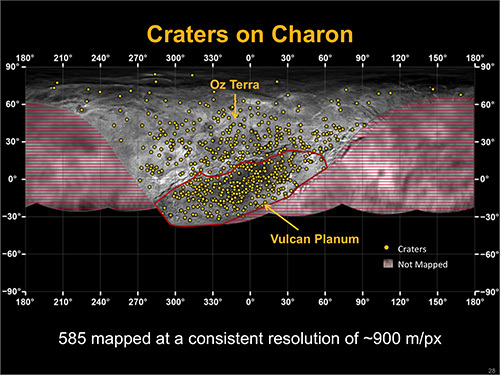 All scale bars are approximately 20 miles (30 kilometers) and images are oriented with north up. 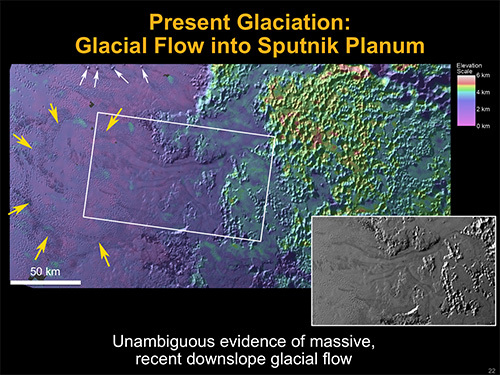 Image sources: “a” and “b” are from the Ralph/Multispectral Visible Imaging Camera (MVIC) at approximately 320 meters/pixel; “c” is from the Long Range Reconnaissance Imager (LORRI) at approximately 130 meters/pixel. 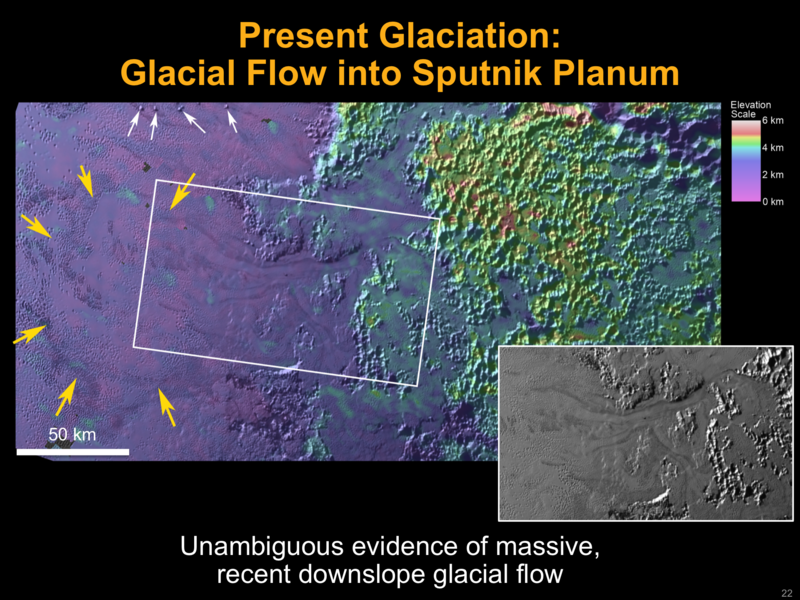 New Horizons scientists have spotted evidence of massive, recent downslope glacial flow in Pluto’s informally named Sputnik Planum region. 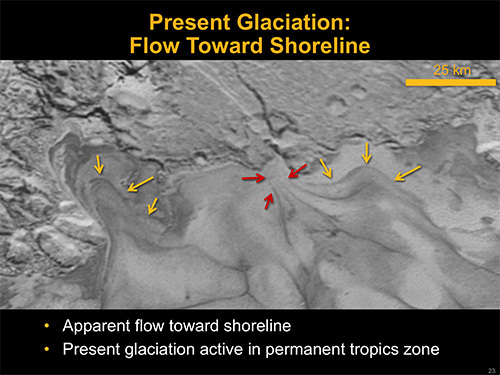 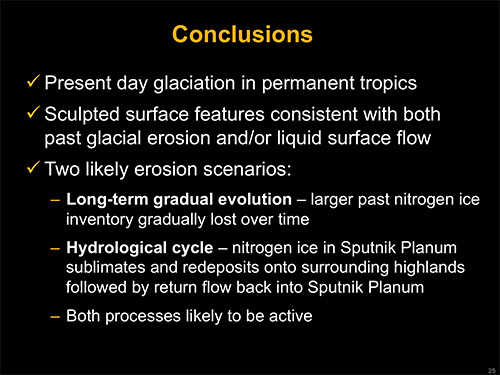 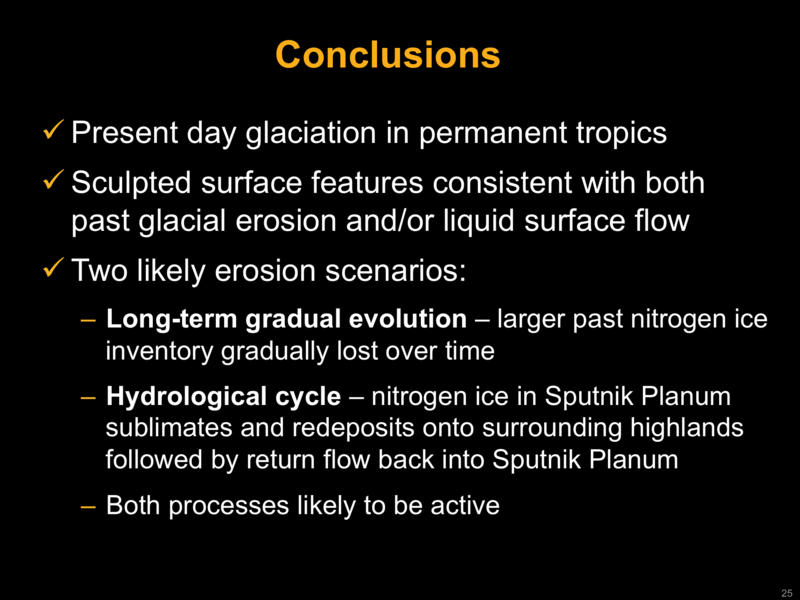 The glacial flow observed by New Horizons scientists appears to move toward the shoreline of Pluto’s Sputnik Planum; active glaciation is occurring in Pluto’s permanent tropics zone. 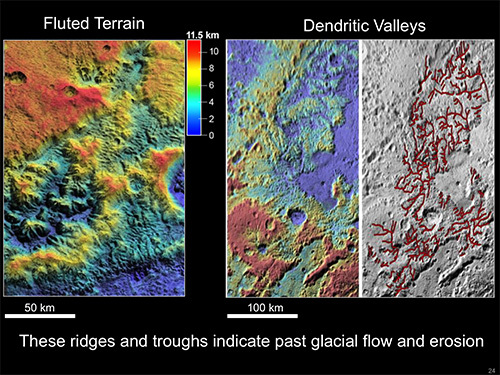 Pluto’s ridges and troughs indicate past glacial flow and erosion. Evidence has long pointed to a giant collision creating Pluto’s system of moons, as opposed to the small moons being captured objects. 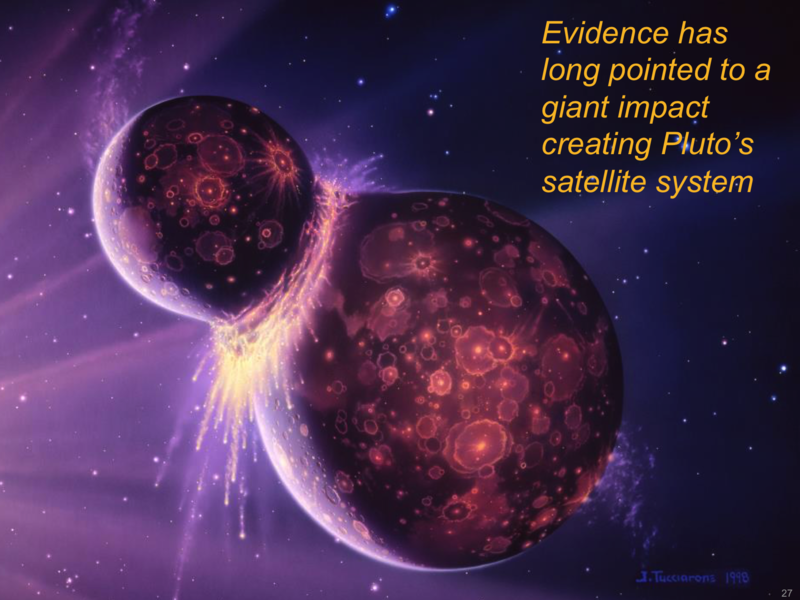 Evidence includes the moons’ co-planar, circular orbits and their similar brightness (which is brighter than most Kuiper Belt objects). 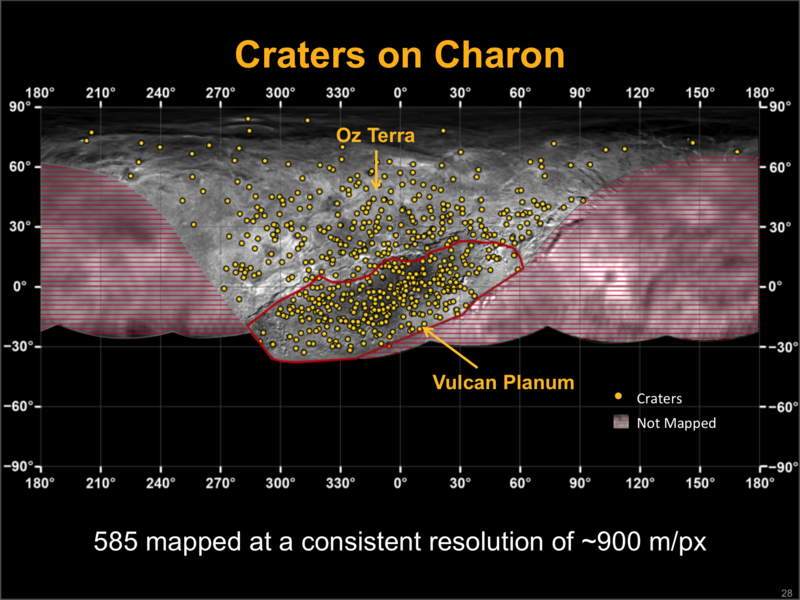 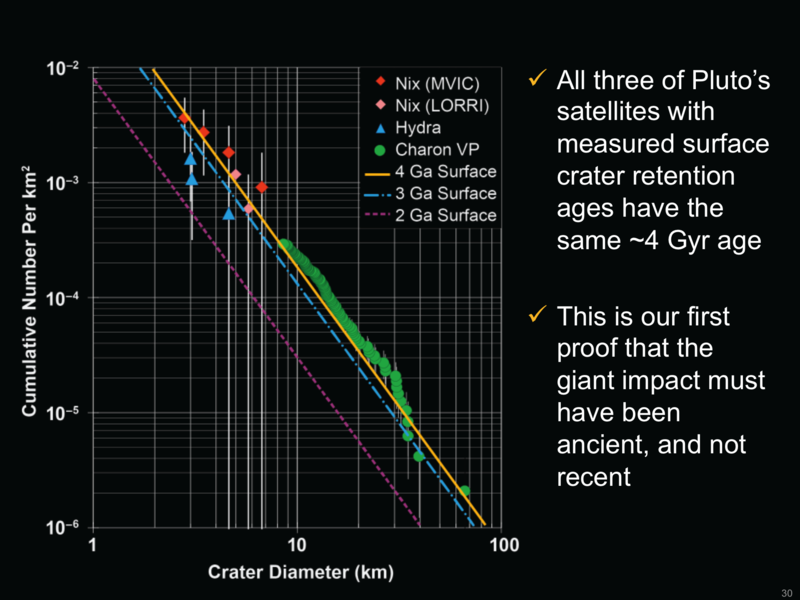 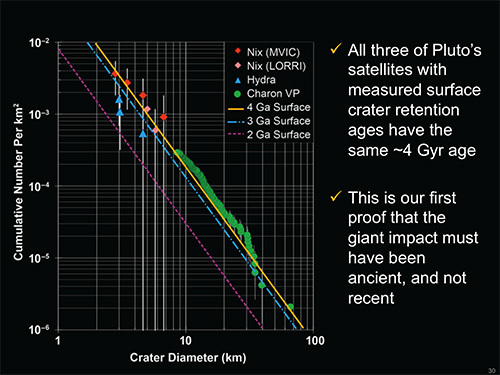 Crater measurements help scientists estimate the “age” of a planetary body’s surface. 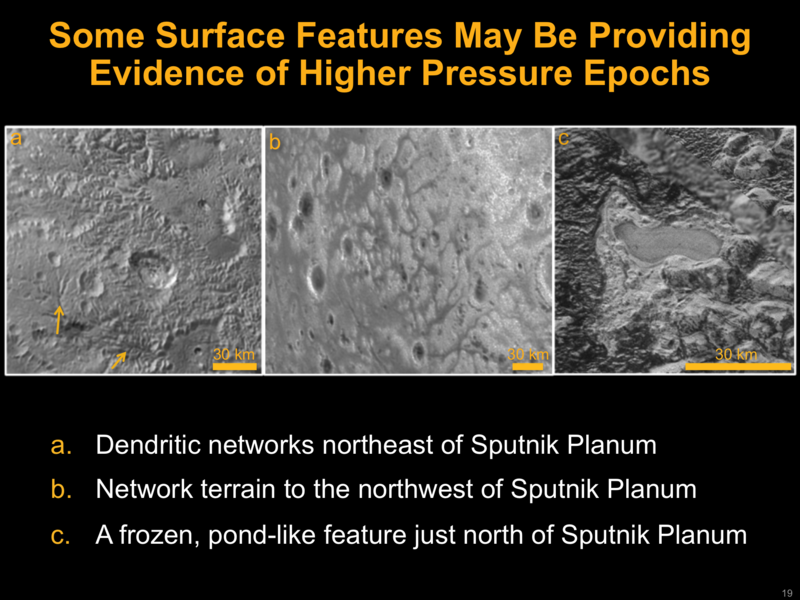 Crater measurements help scientists estimate the “age” of a planetary body’s surface. 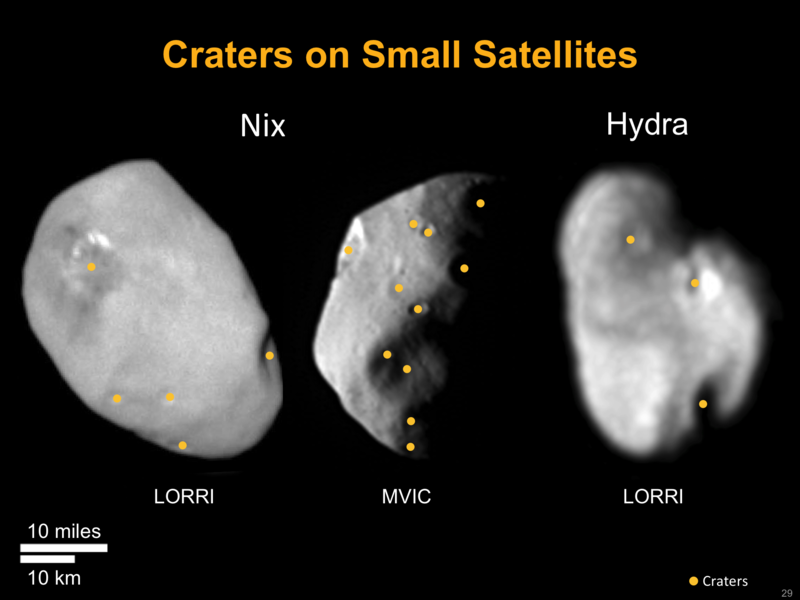 These images of Pluto’s smaller moons were taken by the Long Range Reconnaissance Imager (LORRI) and Ralph/Multispectral Visible Imaging Camera (MVIC) on the New Horizons spacecraft.